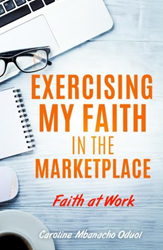 Caroline Mbanacho Oduol’s new book Exercising My Faith in the Marketplace ($12.99, paperback, 9781545608098; $6.99, eBook, 9781545608104). This autobiographical book depicts the author’s journey from college to the workplace, and how her growing faith in God factored into the decisions she made for her career, personal life and spiritual maturation. The book shares Insights acquired along the way that will help readers bring their faith into their career, and successfully navigate the corporate ladder without compromising their Christian values. Caroline Mbanacho Oduol is a finance person by profession with over 12 years of experience in local and international markets. She attained a Master’s degree in finance, an undergraduate in economics, and is a member of ICPAK, (CPA (K)). Oduol is a graduate of Purpose Leadership Forum. This is her first book. Xulon Press, a division of Salem Media Group, is the world’s largest Christian self-publisher, with more than 12,000 titles published to date. Retailers may order Exercising My Faith in the Marketplace through Ingram Book Company and/or Spring Arbor Book Distributors. The book is available online through xulonpress.com/bookstore, amazon.com, and barnesandnoble.com.